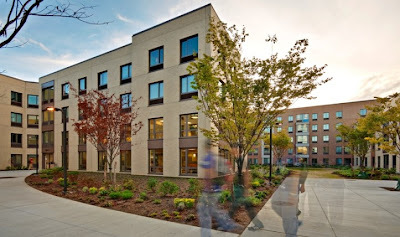 The "Summit", the first on-campus housing at Queens College, is a 510-bed residence is divided into two wings of apartment-style suites with private bathrooms and kitchens. Additional shared amenities for residents include an exercise facility, music practice rooms, laundry room, student recreational areas, and dedicated study lounges. Sustainable design elements include native and adaptive vegetation for landscaping, low flow faucets and shower heads to reduce occupants water usage, energy efficient lighting and occupancy sensors tied into the building management system. Incorporated into the design is an 89-space parking garage with a green roof, creating a student courtyard and multipurpose terrace. The Summit student housing project at Queens College in New York City employed extensive use of prefabrication, to complete a high-quality building on time and on budget that achieved significant green goals. The project employed prefabrication in two ways. The first was the use of prefabricated concrete floor planks, a relatively common practice. The project also incorporates a lightweight, load-bearing prefabricated exterior walls, a new approach that the team developed specifically for this project. The system consists of wall sections that typically measure 30 feet, each of which incorporates a metal stud structure with nearly all of the wall components factory installed, including glazing, exterior skin, insulation, and vapor barriers, every component except the electrical wiring and interior finishes. All of the team members, from the architects to the developer to the construction manager, credit the research they did early on to not only help them create a system that worked effectively but also to help them gain the buy-in of both the owner and the developer, a critical success factor for this approach. Ultimately the benefits of the decision to use prefabrication accounted for a significant amount of time savings by allowing enclosing of the building as quickly as possible to permit the interior finishes to be installed more efficiently, while phasing, enabled by prefabrication, facilitated construction of different sections of the building at various times throughout the schedule. The projects sustainability goals also took advantage of prefabrication. Prefabrication in a controlled environment creates much less waste than a comparable site built building. Additionally, there was an estimated savings of 70%–80% in raw material use due to the use of split tile brick, compared to face brick which is typically used in this type of application. Large prefabricated panels have fewer joints that need to be sealed on site which resulted in a tighter building envelope helping the project meet its energy efficiency goals. “The Summit,” which was awarded LEED Gold Certification in 2011, is the first LEED Certified student residence in the City University of New York system, and the winner of the 2009 Queens Chamber of Commerce: Excellence in Design!